Every time I tell people to play Botanicula, they make the same joke: "Sounds like Bunnicula." And I shake my head and wish that this lovely game had a different name. If people would just get around the silly title and play the game, they'd find one of the most charming games of the last few years. Now it's found a new home on iPad, and it fits right in. I don't have much to say about the iPad version of Botanicula that I haven't already said about the PC version, which came out in 2012. It's charming as hell, beautiful, smart, and it has one of my favorite game soundtracks, created entirely by the two-person musical outfit DVA. Back in 2012, I said this about the game: "Botanicula is only on PC but feels destined for the iPad, so you should play it so that in six months when all the iPad people are freaking out you can be all hipster about it." It took a while longer than I thought it would, but PC players, your time for hipsterism has come. Botanicula is so adorable that it can only be controlled by picking up a puppy and moving its puppy paws on your computer's trackpad. Botanicula is so funny that after they played it, the cast of Parks & Recreation said, "Wow, that's pretty damned funny." Botanicula's music is so good that the people who wrote the theme song to Parks & Recreation said, "Wow, that is some damned good music." Botanicula's sound effects are so good that you won't even notice that a lot of them involve a dude making chewing sounds in close proximity to a microphone. You'll even think it sounds cute. Botanicula is only on PC but feels destined for the iPad, so you should play it so that in six months when all the iPad people are freaking out you can be all hipster about it. Botanicula is so charming that it stole Julia Roberts away from Pretty Woman-era Richard Gere. He was pretty pissed but reported that he "couldn't stay mad at [Botanicula]". Botanicula is so organic that it won't deign to be sold in Whole Foods. It is so organic it lets out a quiet-but-not-that-quiet snicker every time someone brings up The Omnivore's Dilemma at a dinner party. Botanicula is so clever that it snuck up behind the raptor that snuck up on Muldoon in Jurassic Park. "Clever game," said the raptor. 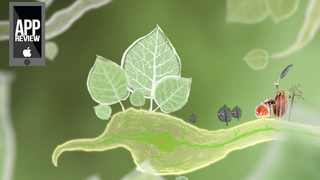 Botanicula is so damned good that it probably won't even wind up on Metacritic. The game is now out on iPad, and it's well worth playing (or replaying). It looks incredible on the iPad's screen, particularly if you have a retina model, and the tactile nature of the game is a perfect fit for a touchscreen.